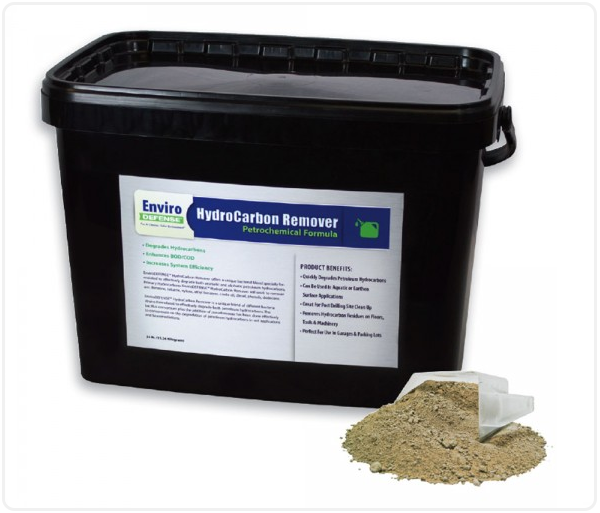 EnviroDEFENSE® Hydrocarbon Remover is a unique blend of multiple bacteria strains specifically formulated to effectively degrade both aromatic and aliphatic petroleum hydrocarbons. The Bacillus consortium plus the addition of Pseudomonas has been done to effectively concentrate on the degradation of petroleum hydrocarbons in soil applications and bioremediations. EnviroDEFENSE® Hydrocarbon Remover's proprietary blend of bacterial cultures instantly work to degrade the light-distilled oil fractions, as well as the heavier fractions of hydrocarbons normally associated with #4, #5, and #6 fuel oils, crude oil and coal tar. Soil Application (Well Sites): Mix 5 lbs. (2.27 kg) of EnviroDEFENSE® Hydro Carbon to 55 gallons (208.2 L) of water and spray over surface, then till soil vigorously. Hard Surface Application: Mix 8 oz. (227 g) of EnviroDEFENSE® Hydro Carbon to 1 Gallon (3.78 L) of water. Heavily mop over surface and let water stand. Several moppings may be needed to remove oils and greases.